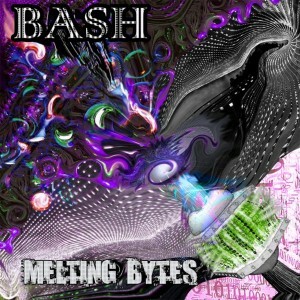 Melting Bytes is an explosive new work by Bash (Andreh Torres), a well-established darkpsy producer from Brazil. Released on Under Voice Records, this collection of three songs is pure night music filled with hypnotic patterns and raging beats. Included is a neuron-shaking collaboration with Naverius (Enrique Garcia) from Mexico. Mastered by Andreh Torres at RDStudio, Brazil, with artwork by Fr3ak. MP3 Download | FLAC Download | WAV Download · Download count: 9,731. Proud that you are in the Crew!! Very nice my friend! Keep rocking! Love this type of freq. aeee andre!! mandou mt na produção! mt foda!!! Maybe this EP will be the last one made by Bash, and i can say thats is a good way to finish my duty! yeeeaaaa!!!! esto si es psytrance mexicano…..
No es MExicano, es Brasileño! Brazilian way of psycho tunes!!! Mto bom Andreh!!! e pra quem num conhece vale conferir o projeto de progressive dele tb!!! Wicked!! !